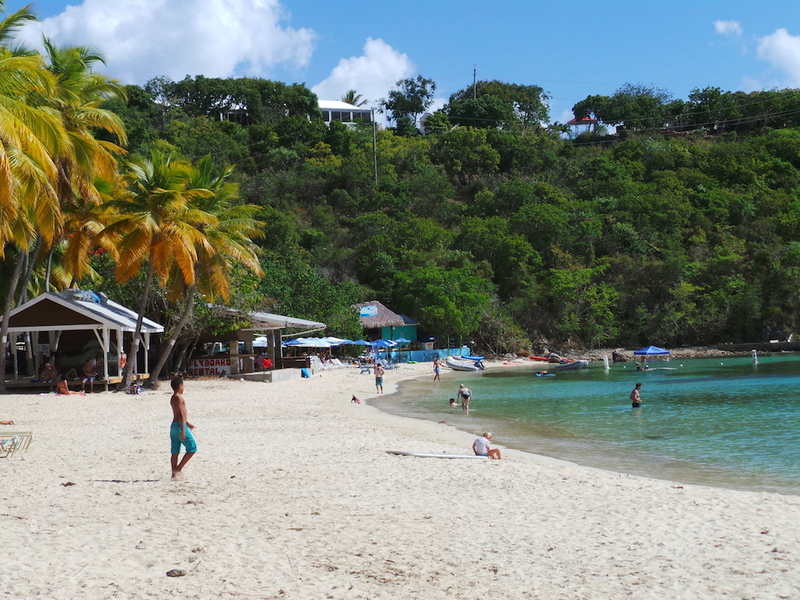 Recently listed at Yahoo Travel as #5 on the list of top ten hidden beaches, Honeymoon Bay on Water Island offers a different experience from Magens Bay or other popular beaches in the US Virgin Islands, such as Sapphire Beach, and is noticeably less crowded. Arriving mid-afternoon at Crown Bay Marina we boarded the Water Island Taxi under the control of the affable Captain Joe. The ferry leaves from the foot of Tickles if you become lost. We enjoyed an 8-minute ride to Water Island and once arriving at Phillips Landing hopped off the boat to be greeted by both Kelly of Kelly’s Karts and Paul who can be found at Dinghy’s bar. Loading up supplies, we jumped on the back of Paul’s truck and headed to Honeymoon Bay, which happened to be a quick jaunt up a hill, and then right back down. 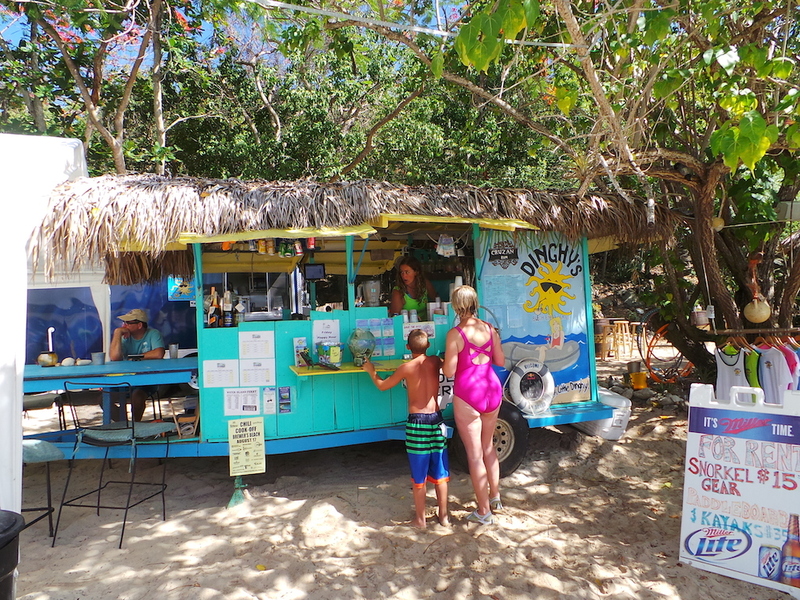 If you are not lucky enough to be with a local, head over to Dinghy’s and order up a bushwhacker, a wonderfully intoxicating concoction to enjoy in the warm Caribbean weather. For a slight change, order up a paddle-whacker, which includes chocolate and peanut butter, the dessert lover in your family will probably prefer it. Spending two nights “glamping” in the Shaffer Hall facility, our tents were set up about 20 feet from the waterline. There is nothing like the sound of waves rolling along the shore to lull you into a relaxed state. Waking up, you can head out skin diving and enjoy the natural aquatic life of the area. After eating breakfast, you can arrange to rent a golf cart from Kelly for $40 and drive around the island taking in sights, both man made and natural. Flowers and cacti abound, as do a number of nice houses. Venturing to Flamingo Point, you come to the remnants of Fort Segarra. 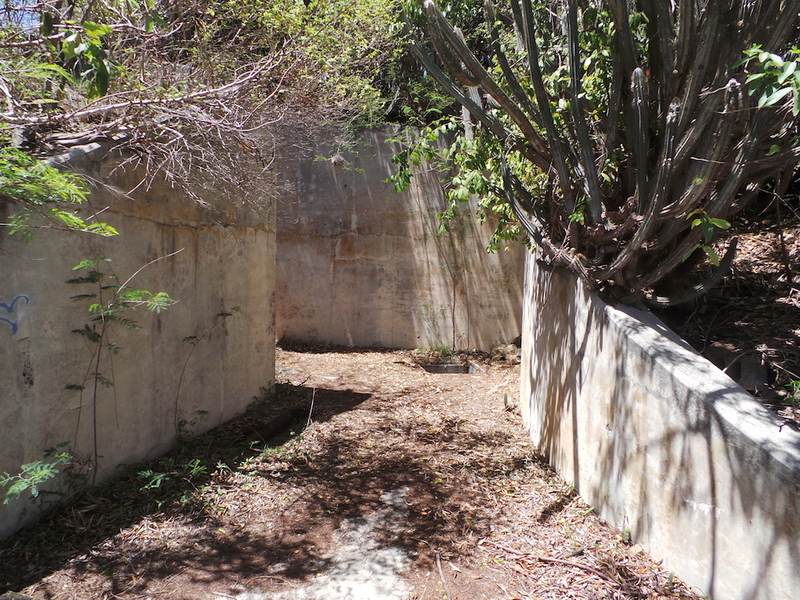 While tours may be available – ask Kelly – you can walk into the tunnels and step back in time to WWII, which is when construction on the fort commenced. The end of the war saw construction abandoned.